I'm a really big fan of the "men hunting men" sub-genre. The Most Dangerous Game is one of my favorite short stories, and I've even got the DVD of the 1932 film adaptation. It's a plot that's appeared in one form or another in countless works of written fiction, television, and film. One of the most well-known of these works is John Woo's action spectacular, Hard Target. Although by the time the movie came out in the early 90's Jean-Claude Van Damme was already a well-known action movie star, this is one of my favorite JCVD films. I find his ridiculous hair, his long black trenchcoat (in New Orleans, no less), and the Cajunification of his natural accent a welcome change from his usual clean-cut, each-chararacter-a-clone-of-the-next appearance. To add even more awesome to the mix, we've got Lance Henricksen, Arnold Vosloo (who I swear is a mummy, because he doesn't appear to have aged a day in 20 years), Yancy Butler, Wilford Brimley, and Sven Ole Thorson (a personal favorite of mine). Brimley as a friendly backwoods Cajun moonshiner with a penchant for explosives and archery steals more than a few scenes in this film. The plot, if you live under an action-movie rock and have no clue, is simple: Fouchon and van Cleef (Henriksen and Vosloo, respectively) facilitate illegal "man-hunting" expeditions for wealthy men who want to know what it is like to hunt and kill other men. The two travel from city to city around the world with their good squad, finding "volunteers" to serve as rabbits for the chase. These volunteers are typically combat veterans from one war or another; destitute, desperate men who'll risk their lives for a money belt containing $10,000, theirs to keep if they manage to escape their hunters. Of course, we figure out pretty quickly that no one ever escapes with that money. And when Natascha Binder (Butler) comes to New Orleans to find her father Douglas, who has stopped responding to her letters, she discovers that he was recently laid off from work and has become one of the city's many homeless. Doug Binder was a Vietnam veteran, a Force Recon Marine, and was offered money by Fouchon to risk his life in the hunt. He's killed of course, but his murder was concealed by a warehouse fire. Miss Binder hires Chance Boudreaux (van Damme), a down-on-his-luck former Force Recon marine himself to help her find her father, after Boudreaux saves her from a pack of violent thieves. From there, we have a pretty standard but solid action flick. Fouchon and van Cleef go chasing after Binder and Boudreaux through New Orleans and the nearby bayou swamps, with running gun battles, rattlesnake booby traps, lots of stuff exploding everywhere, and multiple spin-kicks to the face. This movie wouldn't rate nearly as high on the awesome-meter if it wasn't for John Woo's ability to make such boilerplate violence into a cinematic ballet of bodies, bullets, spent casings, and flying debris. Everything that makes me groan with disgust when Michael Bay tries it, I cheer and applaud when it is done by Woo. One interesting fact about this film is that the screenplay was written by fellow Bostonian Chuck Pfarrer (who also plays Doug Binder), a former US Navy SEAL turned screenwriter. Beyond the usual action-movie conventions, there is a strong thread of honest concern in the film for the plight of the homeless veteran. Fouchon manages to convince his "volunteers" to risk themselves for the money because, he tells them, with it they will be able to get back on their feet again - get a place to live, buy new clothes, find a job - in other words, be a man again. This lure dangled in front of the starving pride of these men is tempting bait indeed. Pfarrer makes a point to show the homeless veterans as honest, soulful men who just want a chance to show they still have something to give to the world. 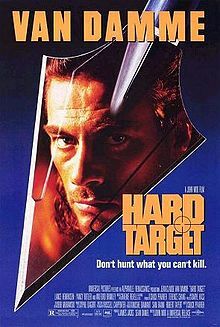 If you haven't seen Hard Target, you need to "take a chance" and check it out. As I said earlier, I think it is one of the more entertaining examples of its sub-genre, although above all you need to read and watch The Most Dangerous Game first so you have a firm grounding in the source material. Hard Target was the glory years of Van Damme, along with Time Cop. It's not very philosophical, but damn it's good. Have you seen Surviving The Game with Ice-T and Rutger Hauer? I gotta say it's my favorite in the genre. I haven't, but I know of it. May have to see if it's on Netflix. There are a couple of others there, "Surviving the Game" is one...hmmm I'm sure there's a couple of others! "What kind of name is Chance?" This movie has just the right amount of cheese (see above dialogue) to crack me up but not quite send the movie into the so-bad-its-good territory. It really is a great, fun movie. Action, Brimley acting at his cajunist- with dynamite arrows and other fun toys, and the trademark weird visual flourishes that Woo loves. I always chuckle at the birthday cake candle fade out. But that said, still an extremely fun action movie from the 90's. Allow me to also plug "Surviving the Game." Very much worth checking out.